Solon Councilman Ed Kraus, left, listens to Shaker Heights Councilman Rob Zimmerman give the D’Var Torah during Jewish Elected Officials of Cuyahoga County’s meeting in March at Corky and Lenny’s restaurant In Woodmere. Kraus and Zimmerman are among the group’s founders. 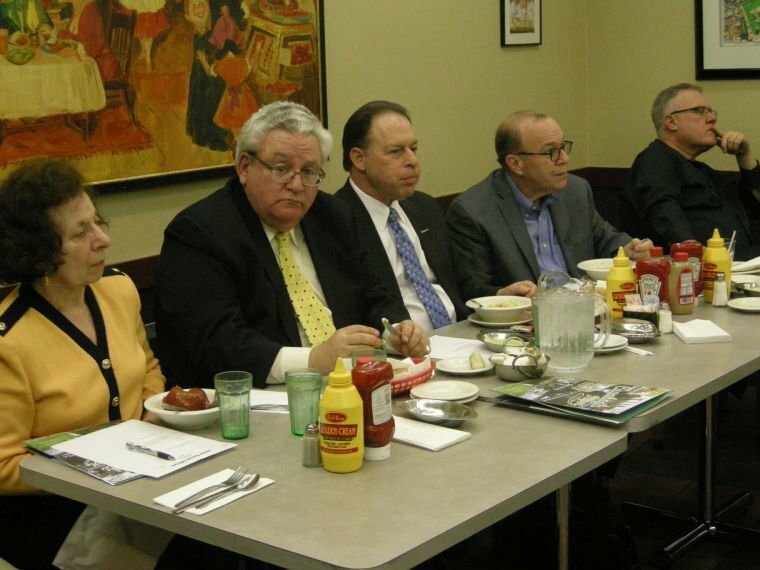 Orange council members Frances Ritsky Kluter and Herb Braverman, from left, Beachwood Mayor Merle Gorden, Beachwood Councilman Fred Goodman and Lyndhurst Councilman Lane Schlessel listen to a panel of law directors discuss economic development and other topics during Jewish Elected Officials of Cuyahoga County’s meeting in March at Corky and Lenny’s restaurant In Woodmere. South Euclid Councilman Marty Gelfand, left, and Bruce Hennes, right, co-owner of Hennes-Paynter Communications, listen to Margaret Anne Cannon, law director for Beachwood and Moreland Hills, discuss economic development during Jewish Elected Officials of Cuyahoga County’s meeting in March at Corky and Lenny’s restaurant In Woodmere. Hennes is the group’s facilitator. Some city council and school board members – along with a few mayors, judges and county council members – have been learning a lot about issues they have in common and how they may be able to collaborate regionally. What do they have in common? They’re all Jewish. Jewish Elected Officials of Cuyahoga County has met three times since last October at Corky and Lenny’s restaurant in Woodmere. The group will meet there again at 5 p.m. Thursday, June 27. Amy Kaplan, director of government relations for the Jewish Federation of Cleveland, will be the speaker at the next meeting. Attendance has been strong – with 20 to 25 officials per meeting – and the level of interest high, said Shaker Heights Councilman Rob Zimmerman, one of the group’s founders. Instead, the group focuses on getting to know one another better and discussing topics of common interest as elected officials and as Jews, Solon Councilman Ed Kraus said. “It’s exactly what ought to be happening, as far as regionalism,” Zimmerman said. Membership is open to all Jewish elected officials who serve or reside in Cuyahoga County. The group has agreed to meet at least quarterly. The roster includes 50 names, led by a six-member steering committee: Cleveland Heights Councilwoman Bonnie Caplan, Beachwood Councilman Saul Eisen, Kraus, Orange Mayor Kathy Urdang Mulcahy, Lyndhurst Councilman Lane Schlessel and Zimmerman. Late last summer, the group asked Bruce Hennes, co-owner of Hennes Paynter Communications, to be its facilitator, and he agreed. Hennes is a past president of the Cleveland Jewish News Board of Directors. Hennes, a Cleveland Heights resident who is Jewish, also sends out reminders to the group about upcoming meetings. He offers his services pro bono. Caplan said she looks forward to the meetings. “There are no responsibilities; nobody has to do anything but show up,” she said. “It’s a higher level of talking and sharing, and there’s a nice camaraderie. Each meeting opens with a D’var Torah, a talk on topics relating to a section of the Torah. 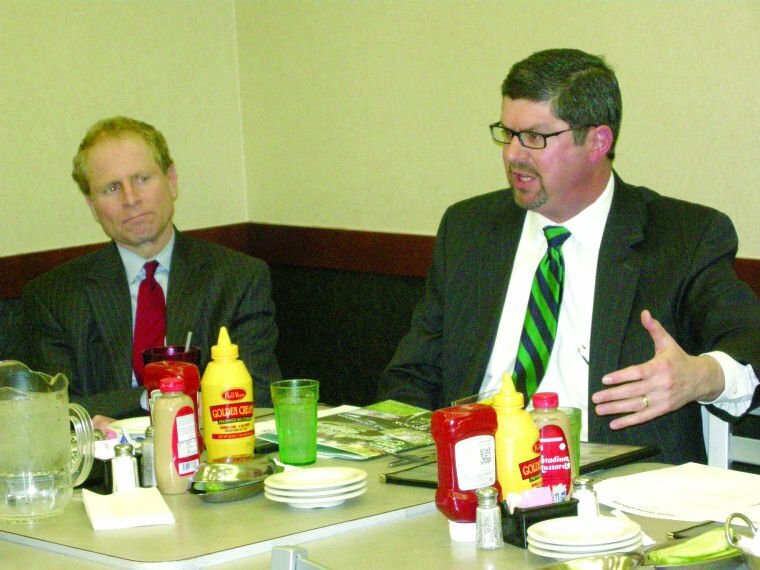 At the last meeting in March, the group heard from a panel of law directors that discussed such topics as economic development, law enforcement and regional collaboration and then took questions from the group.